If you have a Giving on a Budget story to share of a way you or your family has given to others this year or this holiday season, please . I’d love to hear it and possibly share it during this series! I am a firm believer that you should always help with a need when you can, but when my husband was in his last year of school, we hardly had enough of anything to “help” ourselves, let alone anyone else. I knew there had to be some way I could still touch someone else, make their life a little easier, show them that they are not forgotten… I just had to get creative about it! For some reason seeing homeless/needy people on the side of the road has always pulled on my hearts strings, hard. It is difficult for me to imagine falling to that level, to have nothing at all and, it seems, no one at all. My children must have inherited that same compassion, as they are constantly willing to try and give out money to the needy. This seemed like a “good enough idea” until, well, we didn’t have any extra money… and by that, I mean none. For the most part of that last year of school we had to survive somehow, and cutting money from our grocery bills seemed like it could make the biggest impact, so I taught myself to coupon. I would request samples from companies just for the coupons that came with them. After a while I had more toothpaste, shampoo, conditioner, floss, soap, cleansers, lotions, etc. than I would ever use or care to have lying around. My daughter and I decided to put those samples to good use and make little “care packs” to pass out to the needy people we saw on the sides of the road. We decided we would make a goal to fill ten care packs, once we had given them all away we would make more. We used brown paper bag lunch sacks, which my daughter colored with bible verses and pictures, and filled them with all the samples we accumulated along with some water bottles, cans of soup and plastic spoons we found on sale. Due to the samples, some of the care packs were geared more toward one gender and in that case we would mark the bottom of the sacks “male” or “female”. Once we met our goal, I told my daughter to put two in the car as we set out to run errands. I didn’t know until we were way down the road, but my daughter had chosen to bring one female and one male pack instead of the many other gender neutral ones. I said a silent prayer as we drove around that we would be able to find “a male and female” to pass them out to (seemed a little strange praying for homeless couple to appear!). Soon after as we pulled up to a red light, we saw them… two needy people, one male and one female! My daughter was ecstatic, and after we handed over the packs, the smiled on her face was priceless! This small act may not seem like much to anyone else, but by performing it I was able to look and reach beyond my own financial situation, make the day of a stranger in need, and teach my daughter (and myself) that we can always help others in need… no matter what our circumstances may be. If you too are wondering how you can help those around you in creative, low cost ways, I have four ideas below. You can enter online the codes found on the caps and boxes of Coke product to redeem them for prizes. If you already drink Coke products, this costs nothing extra to you. Consider giving prizes like a McDonald’s gift card, a coupon for a free 20 oz. Coke product, or other gifts to those standing out in the elements. Many stylists will give you a referral card for a free haircut if you simply ask. Think about asking for one of these the next time you are in a salon. You could pass it out to someone who might be unemployed and need a hair cut for an upcoming job interview. Many diaper companies enclose codes in their products that you can enter online in exchange for prizes. Many of the prizes are toys for babies and toddlers. Collect points all year and consider redeeming your points for toys that you can donate to needy kids or Toys for Tots at Christmas time. This takes no more than entering the codes — and shipping is even free! Many organizations are more than happy to take your extra Christmas candy and send it to troops overseas. It’s a great way to bless someone else — and save yourself some extra calories! These are just a few of my ideas. What would you add to my list? Looking for more? 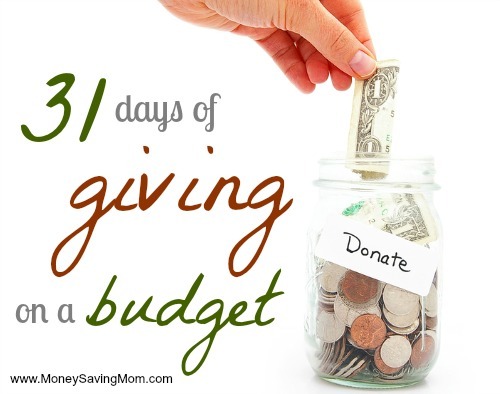 Read more posts about 31 Days of Giving & guest post. You can cut off the Box Tops and Campbell’s soup labels for Education from participating items and donate them to a school. You can tie your store reward card to a charitable organization and for no cost to you the organization will get a percentage of what you spend. Here, Kroger and Target do this. You can pick up extras of the penny items during back to school sales and donate them to the school. When you have no money but you have time, volunteer. Even if it is shoveling your neighbor’s sidewalk. Good deeds move forward. I second the idea to pick up the penny items during back to school sales! I’ve been doing this the last two years and I’m planning to do it again this summer. I’m hoping to find a deal on a few backpacks so then I can put together some back-to-school packages that the local elementary school can give to students in need. I’m part of a group that collects sample and small size toiletries and snacks to send to service people for when they are in the field. Sample and hotel-size toiletries are perfect for this. My husband runs a retail business in a low-income neighborhood. He is constantly being asked for money and he finally grew tired of giving money to those who seem to be using it for substance abuse. 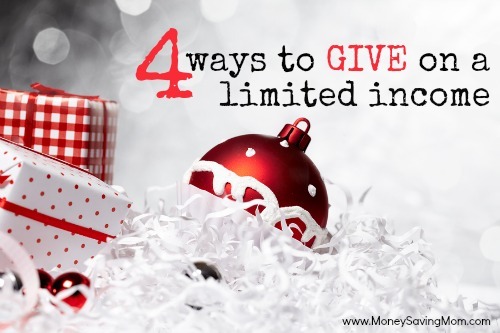 Giving actual needs such as the items you mention in this post is probably the best practice. Now when someone comes to my husband with their hand out (literally), he offers to buy them food or gas or other items, but is often turned down. We just keep praying and do the best we can in our giving. Our family has been enriched by donating our time and talents to a local mission that services homeless men, women and children. For years, our kids along with church staff played instruments, shared faith stories and just sat with and visited with the mission recipients. Even when we were unemployed four years ago, we felt “rich” in spirit and know that we boosted the lives of others. Нашел в интернете популярный блог , он описывает в статьях про www.chemtest.com.ua.